Only partial results available. This was a 64-player knock-out tournament, in which the losers in the first round competed amongst themselves as a separate section subsequently. All 64 players and their first round pairings are listed in the 18 Oct. 1881 issue of the Chess Player's Chronicle (p.504), but without results. Many of the outcomes can be deduced from later reports, though often not the scores. Two wins were required to win a pairing; where I only know who advanced to the next round, I list the score as 1-0, to be conservative. The result of Down-Taylor was reported in the 18 Mar. 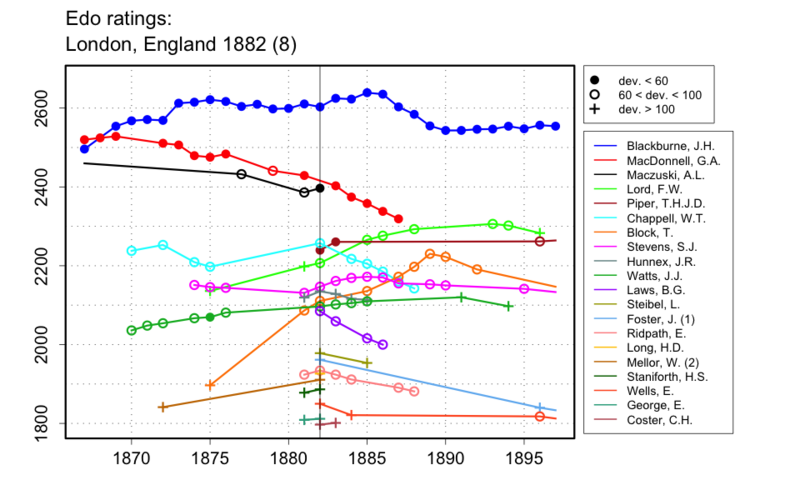 1882 issue of Land and Water as +1-1=0, but since we know Down advanced to the next round, I guess that it finished +2-1=0 for Down, though there may have been draws.